A Twitterbot is a program that integrates with the Twitter platform, automatically posting, retweeting, liking, or following other users. Twitterbots can prove to be useful through providing interesting information or updates, and they can also be fun or humorous. It is important to exercise care when creating Twitterbots, as not only are harassment and spamming not OK, but they will cause your Twitterbot’s account to be suspended for violating Twitter’s Terms of Service. Prior to creating a Twitterbot, you should become familiar with Twitter’s Automation rules and best practices to ensure that your Twitterbot is a good member of the Twitter community. This tutorial will walk you through two Twitterbot programs, one that tweets from a file, and one that retweets, follows, and favorites. Additionally, we’ll go through storing your credentials in a separate program file, and keeping the Twitterbot running on a server. Each of these steps are optional, but they’re presented in the order you would carry them out. Although you can use a local computer to set up and run a Twitterbot, if you would like it to be continuously running, a Python programming environment on a server would be ideal for this project. Additionally, you should have a Twitter account that is associated with a valid phone number, which you can add via the Mobile section of your Settings when you’re logged in. You’ll need to create a Twitter app and install the Python Tweepy library, which you can do by following our “How To Create a Twitter App” tutorial. You should have your Consumer Key, Consumer Secret, Access Token, and Access Token Secret in hand before beginning this tutorial. As part of this project, we’ll be using Python to read files. To familiarize yourself with working with text files in Python, you can read our “How To Handle Plain Text Files in Python 3 guide. You can keep your Twitter Consumer Key, Consumer Secret, Access Token, and Access Token Secret at the top of your program file, but for best practices, we should store these in a separate Python file that our main program file(s) can access. Anyone who has access to these strings can use your Twitter account, so you don’t want to share these or make them public. In addition to security, keeping a separate file can allow us to easily access our credentials in each program file we create. We’ll create variables for each key, secret, and token that we generated (if you need to generate those, follow these steps. Replace the items in single quotes with your unique strings from the Twitter apps website (and keep the single quotes). We’ll be calling these variables in our other program files. Creating this separate credentials.py file also allows us to add it to our .gitignore file in case we plan to release our code through Git. We can use Python’s ability to handle and read from files to update our Twitter status. For this example, we’ll use a file that already exists, but you may want to create your own file, or modify an existing file. Next, let’s set up our Twitter credentials by either adding them to the top of our file, or importing what we have stored in the credentials.py file we set up in the section above. We’ll also add 3 lines to interact with the credential variables via the Tweepy library. To learn more about this set up, be sure to have a look at “How To Create a Twitter App.” To find out more about OAuth, you can read our introduction. We’ll be using Python’s file handling capabilities, first to open the file, then to read lines from the file, and finally to close the file. With our file downloaded, we can create variables and add the relevant functions underneath the lines we’ve just set up to handle credentials. With this set up, we can now work on adding code to make these lines output as status updates to our Twitter account. With our file’s lines stored in a variable, we’re ready to update our Twitterbot account. We’ll be using the Tweepy library to interact with the Twitter API, so we should import the library into our program. We’re also going to be automating our Tweeting in a time-based way, so we should import the module time. For our purposes, we’ll only be using the sleep() function, so we’ll only import that specific method. If you run the program at this point with the command python twitter_textfile.py, you’ll see the entire verne.txt file output onto your terminal window since we have no other code or call for it to stop. Rather than receive output in our terminal window, we want every line to become a new tweet. To achieve this, we’ll need to use the tweepy function api.update_status(). This is used to update the authenticated user’s status, but will only update if the status is either: 1) not a duplicate, or 2) 140 characters or less. Now our program is setup to tweet lines to our account. In Python, \n is the escape character for blank lines, so our ifstatement is telling the program, if the line is not equal (!=) to a blank line, then we should go ahead and print it. Otherwise, Python should ignore the line. We’ll look at the statement in context just below. For our testing purposes (and only for our testing purposes), let’s use 5 seconds instead. Once we are running our Twitterbot regularly, we’ll want to greatly increase the time between tweets. You can play around with where you add sleep(5) — where we have placed it below will cause a little more of a delay between tweets since there will be a delay even if the line is blank. When you run the program at this point — if you have not run the program before — you’ll start getting output on your terminal of the first lines of the file. These lines will also post to your authenticated Twitter account. You can fix this by deleting either your previous tweet from your Twitter account, or by deleting the first line of your file verne.txt and saving it. To stop the program from outputting status updates to your Twitter account, hold down the CTRL (or control) and C keys together on your keyboard to interrupt the process in your terminal window. At this point, your program can run, but let’s handle that error that we get when the status is a duplicate. To do that, we’ll add a try ... except block to our code, and have the console print out the reason for the error. Running the program now will handle exceptions so that you can keep the program running. You can modify the time between tweets to, say, 15 minutes, by modifying the sleep(5) function to sleep(900). As you continue to work with files in Python, you can create separate scripts to chunk the lines of your files in ways that make more sense to you, being mindful of the 140-character tweet limit. At this point we have a fully functional Twitterbot that tweets from a source file. In the next section we’ll go over an alternative Twitterbot that retweets, follows, and favorites. You can also skip ahead to the section on Keeping the Twitterbot Running. By using the Tweepy library, we can set up a Twitterbot that can retweet and favorite the tweets of others, as well as follow other users. In our example, we’ll base these behaviors on querying a search term in the form of a hashtag. To begin, let’s create a Python file called twitterbot_retweet.py. We should either add our credentials to the top of the file, or add our import statements and access to each of our keys, secrets, and tokens via the credentials.py file we created in the Storing Credentials section above. We’ll also add 3 lines to interact with the credential variables via the Tweepy library. While this specific scenario does not actually yield any results, let’s keep our query of #ocean, then designate a time frame of two days to retrieve tweets, limit our location to 100km around Singapore, and ask for French-language tweets. To play around, you should swap out each of the strings to get results that are meaningful to you. To learn more about the different parameters you can pass through this and other Tweepy functions, consult the Tweepy API Reference. All error codes and responses are available via the Tweepy API. To improve our code, rather than just printing the associated Twitter username, let’s use some error handling with a try ... except block. We’ll also add a StopIteration exception that will break the for loop. Now we can start telling our Twitterbot to do some actions based on the data being collected. 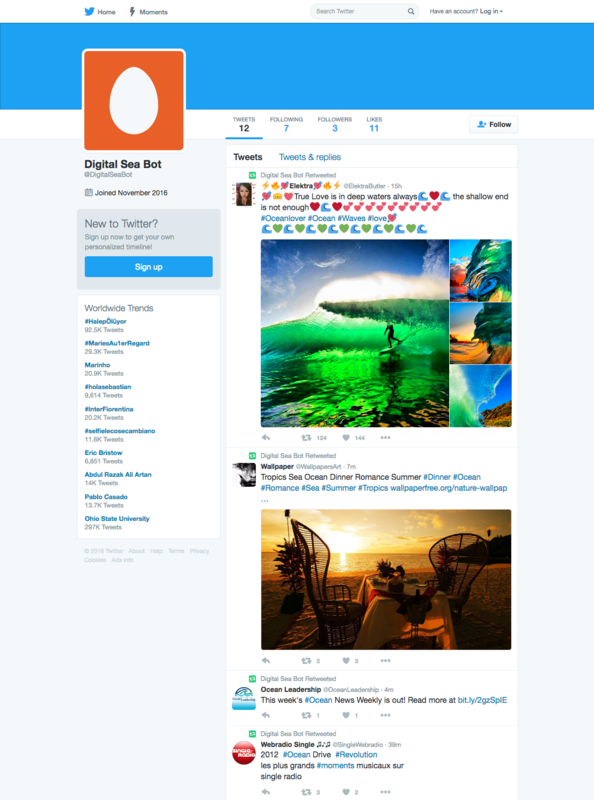 We can add functionality to have the Twitterbot favorite the found tweet and follow the user who produced the tweet. This is done in a similar syntax and style to the format for retweeting. You can continue to modify this code to your liking and introduce more ways to handle various situations. Now let’s get into how to keep this Twitterbot running on our server. Because Twitterbots do ongoing and automated tasks, you may want to keep the program running even when your computer is sleeping or turned off. With a server, you can keep your program running as long as you would like. For this example, we’ll use the twitter_retweet.py file, but you can also use the twitterbot_textfile.py file, or any other Twitterbot file you’ve created. Ensure that all associated files are available in the same directory of the server. Note: Before keeping one of these programs running, it’s best to modify your program in order to pass more time to the relevant sleep() functions since your Twitterbot will be running 24/7 until you manually stop it (or until the text file you pass to it is complete). Recall that the sleep() function takes in seconds as its parameter, so sleep(3600) would time your tweets to occur every hour, sleep(7200) would time your tweets to occur every two hours, etc. The more frequently you tweet, especially with a given hashtag, the more likely your Twitterbot will get unwelcome attention and bother other users causing your account to be locked. Again, refer to Twitter’s Automation rules and best practices if you’re unsure about how best to use your Twitterbot. To keep our Twitterbot program running, we’ll be using the nohup command which ignores the hangup (HUP) signal. By using nohup, output that normally appears in the terminal window will instead print to a file called nohup.out. Check to see if there are errors and make modifications to the program as needed, kill the process, and then run the nohup command again and check your Twitter account for a new tweet. Once you have verified that your Twitterbot is running, use logout to close the connection to your server. If you run the command ps -x again, the process of the Python Twitterbot will no longer be there. This tutorial walked through setting up and running two different versions of Twitterbots to automatically interact with the Twitter social media platform. There is a lot more that you can do with the Twitter API and with libraries like Tweepy that make it easy for developers to make use of Twitter. From here, you can also go deeper into the Tweepy library and Twitter API to create lists, add users to lists, engage with direct messages, and streaming with Twitter to download tweets in real time. You may also consider combining the functionality of the two Twitterbots we created above. In addition to making interactive Twitterbots, you can also do substantial data mining by making use of the Twitter API.